I've long admired Zatchels collection of bags and always pop over for a look at their latest designs when I'm in Liberty. Zatchels make the cutest leather satchels which you can personalise with a special message alongside stylish saddle bags and barrel bags which look ideal for summer festivals! Their bags come in a rainbow of colours including eye catching metallic's. I adore the sweet polka dot collection and of course not forgetting their fabulous Hello Kitty collaboration last year! Luckily for me (.. and all you other Zatchels fans out there) they're holding a flash sale with 50% discount off all bags in celebration of their 2nd birthday. The 50% off runs until midnight tonight so get your orders in fast! With such an amazing discount on offer I felt it was fate telling me to buy one! 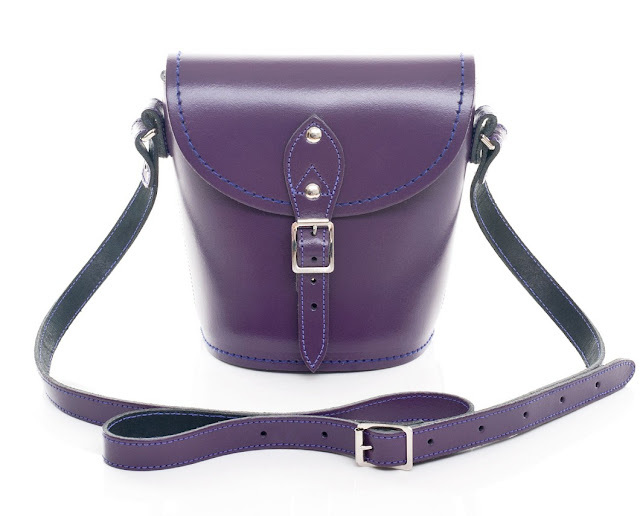 After much deliberating over which style to go for I've chosen the classic purple leather barrel bag which usually retails at £45.00. I love the shape of the barrel bags and can see it becoming a firm favourite of mine over the summer months. With the 50% discount + £5.99 delivery I've bagged myself one of these beauties for under £30 = happy Caroline! Are you a Zatchels fan? What have you bought in their birthday sale? What a good deal! That bag is lovely! I would make a really good camera bag! Enjoy your new leathered beauty!